We identify that the projected uncertainty of the pan-Arctic sea-ice concentration (SIC) is strongly coupled with the Eurasian circulation in the boreal winter (December–March; DJFM), based on a singular value decomposition (SVD) analysis of the forced response of 11 CMIP5 models. In the models showing a stronger sea-ice decline, the Polar cell becomes weaker and there is an anomalous increase in the sea level pressure (SLP) along 60°N, including the Urals–Siberia region and the Iceland low region. There is an accompanying weakening of both the midlatitude westerly winds and the Ferrell cell, where the SVD signals are also related to anomalous sea surface temperature warming in the midlatitude North Atlantic. In the Mediterranean region, the anomalous circulation response shows a decreasing SLP and increasing precipitation. The anomalous SLP responses over the Euro-Atlantic region project on to the negative North Atlantic Oscillation–like pattern. Altogether, pan-Arctic SIC decline could strongly impact the winter Eurasian climate, but we should be cautious about the causality of their linkage. 本研究分析了CMIP5 11个模式对冬季(12月至翌年3月)北极海冰面积在本世纪末的预估的不确定性及其与欧亚环流的关系. 我们通过奇异值分解 (SVD)得出两者强耦合的主模态, 当中反映了北极海冰覆盖范围的预估. 当北极海冰范围减少的预估值比模式集合更大时, 极地环流相对更弱, 其南侧(约北纬60度)出现异常的下沉气流, 乌拉尔山至西伯利亚地区及冰岛一带的海平面气压相对更高. 与此同时, 中纬度的西风带和费雷尔环流 (Ferrell Cell) 相对更弱, 北大西洋海温相对更暖. 在地中海地区, 海平面气压相对偏低而降水相对较多. 此情形下北大西洋气压的差异类似北大西洋涛动的负位相. 总体而言, 北极海冰未来预估的不确定性或会影响到欧亚冬季气候的预估, 不过我们须谨慎分析它们的因果关系. The work of HC, NK and NO was supported by grants from the European Research Council (ERC) project (Grant No. 648982) and NordForsk under the GREENICE (Grant No. 61841) and ARCPATH (Grant No. 76654) projects, and the work of WZ was supported by grants from the Research Grants Council of the Hong Kong Special Administrative Region, China (CityU 11335316 and 11305715). The authors also benefit from high performance computing grants (NOTUR2, project no. NN 9390K; NORSTORE, NS9064K). 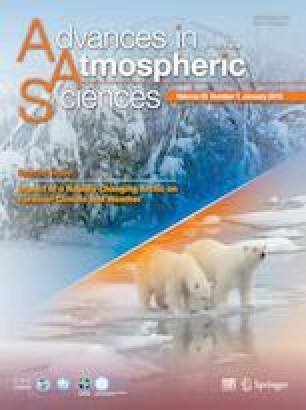 The authors acknowledge the World Climate Research Programme’s Working Group on Coupled Modelling, which is responsible for CMIP, and we thank the climate modeling groups (listed in Table 1 of this paper) for producing and making available their model output. We also greatly appreciate the valuable comments given by the two anonymous reviewers, which helped improve the clarity of our results. Open Access. This article is distributed under the terms of the Creative Commons Attribution 4.0 International License (http://creativecommons.org/licenses/by/4.0/), which permits unrestricted use, distribution, and reproduction in any medium, provided you give appropriatecredit to the original author(s) and the source, provide a link to the Creative Commons license, and indicate if changes were made.